휴, 베트남의 오키드 호텔 | 호스텔월드에서 예약하세요. The Orchid Hotel in Hue is a new 'boutique' style hotel with 5 star rooms and amenities that one would not expect to see in a hotel of this class, coupled with well presented, friendly staff and excellent value for money the Orchid very much lives up to its corporate slogan, ''Always Most Pleasure''. 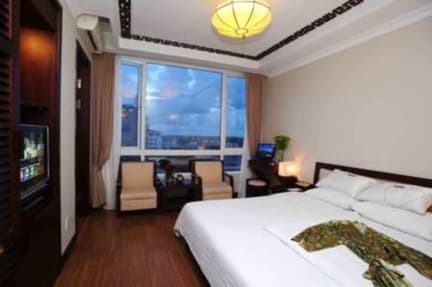 What did customers like about Orchid Hotel? My son and I traveled to Hue for both business and pleasure. 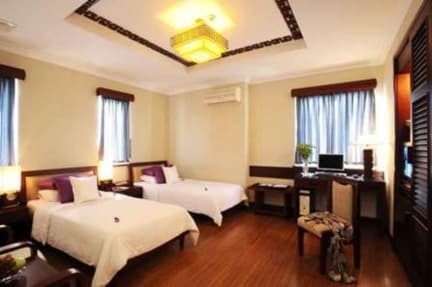 We found this hotel on tripadvisor.com, and this is the best place we stayed on our trip through four cities in Vietnam (Ho Chi Minh City, Vung Tau, Hue, and Hanoi). Not only that, it has the nicest and most competent and caring staff of any hotel I have ever stayed in anywhere in the world. What a place! This hotel is beautiful, with curb appeal from the outside, and it is just as attractive inside. Its lobby is intimate and lovely, the dining room has a beautiful decor with a fountain on one wall. The room we were in is elegant, with a wood appointed decor and great beds, with free internet access constantly available on the provided in room computer. The most marvelous thing at the Orchid Hotel is something money cannot buy, a staff that truly is caring and genuinely passionate about providing the best quality service anyone can imagine. From housekeeping to the manager, they were superior. The bellmen where always there to help and to arrange services and trips needed, the receptionists at the front desk were like best friends, making you feel so welcome 100% of the time regardless of which one was on duty (thank you all so very much), the cooks and waitresses in the restaurant always had a great breakfast tailored to individual needs, the driver in the hotel car provided for an out of town business trip to Da Nang and found a conference when I had no real address for it...he was amazing. These wonderful people all make you feel not only welcome, but as part of their family while there. There is a gentleness, and genuiness about this staff that starts at the top, from the manager, Mr Dung,who so obviously cares about his staff and it resonates through the entire hotel. They greet you when you come down by name and worry about you when you do not. They truly care about their guests as if they have welcomed you into their personal homes and show you the best care that I have ever had in a hotel anywhere. This is a world class staff, whose style should be envied by any hotel regardless of how many stars it has acquired. For service alone, on a five star hotel rating scale, this staff gets a rating of ten stars from me. They are over the top, way over the top! If I could make a suggestion, it would be that other hotels world wide should send staff to the Orchid Hotel to see how a hotel should treat guests. It would improve hotel service for any who copied their style and sophistication. I would recommend this hotel to anyone, from travelers such as my son and I, to kings and political leaders. They made us feel like royalty and we are just a teacher and a college professor. We felt as if they scattered flower petals in our paths where ever we went, and somehow, I think they really did. Only they and we know how much that is really true!